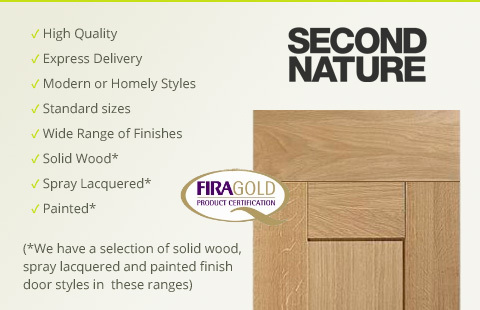 Our range of Second Nature kitchen doors consist of a selection of high quality solid wood kitchen cabinet doors in a wide range of finishes including paint and spray lacquered. Complete your kitchen with designs that fit seamlessly into any modern or country kitchen. Our collection of Second Nature kitchen doors offer a durable and stylish option to your kitchen design. Browse our full range of kitchen doors and kitchen door handles to find your perfect combination.